"Saddle up and take the lead with our family"
Whether you are a beginner, expert or somewhere in between, our staff is dedicated to creating an atmosphere of positive learning for all students. Our lesson horses are seasoned pros and can accommodate all riders; children and adults. Group lessons are available Tuesday through Saturday. Call for times. Riding boots or hard soled shoes with a heel. $200.00 for five group lessons and you have six weeks to complete the series. $380.00 for ten group lessons and you have twelve weeks to complete the series. Our lesson riders have the opportunity to participate in the Fall and Spring Gwyn Meadows Farm horse shows. *Therapeutic Horseback Riding Lessons available through Flying High Equestrian Therapy at Gwyn Meadows Farm, Saturdays, 1pm-4pm. For more information about lessons, click on the lessons page for details. 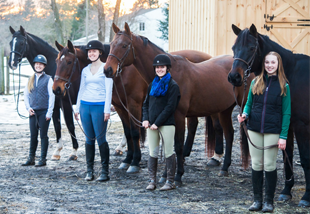 Interested in joining our IEA (Interscholastic Equestrian Association) team? Contact Amy at 610 584-8361 or check out our website page with IEA information.